George Graham Reviews Chicago Afrobeat Project's "What Goes Up"
Since the mid 1980s, world music has been finding receptive audiences in the US. While much of it involves musicians from places, usually Third World countries, where the genres originate, American bands have been taking up styles from Africa and the Indian subcontinent. Sometimes they serve up their music as authentically as possible, but frequently, there is some natural cross-pollenization going on. This week, we have the new recording by one of the most descriptively named bands on the scene, the Chicago Afrobeat Project. It’s their fourth studio album, and it’s called What Goes Up. What is generally called Afrobeat is the style originated and popularized by Nigerian superstar Fela Kuti, who became known almost as much for his activism, persecution and imprisonment by the Nigerian regime at the time, as for his music. Kuti’s Afrobeat was a big ensemble sound driven by horns and a distinctive beat which melded some African influence with soul and funk, often with protest lyrics. Since Kuti’s death twenty years ago in 1997, his style has not faded in popularity. His sons have been carry on with his band, and bands in the style have been appearing in the US on both coasts, with Antibalas in New York, and other groups in Los Angeles. The Chicago Afrobeat Ensemble was formed 15 years ago by a bunch of musicians sharing an interest and love for the West African sounds, but were also open to adding more American soul and funk to the equation. They have become regulars on the touring circuit and their three previous recordings have reflected the band’s energetic stylistic amalgam. The new album What Goes Up, represents something of a change in direction for the group, with the previously mostly self-contained band bringing in several guests. Most notable is drummer Tony Allen, who was a part of Fela Kuti’s band, who brings real authenticity to sound. Also, the group brought in several guest vocalists in styles ranging from soul to hip-hop with a little rapping, to more African-styled. And in the Afrobeat tradition, many of the songs feature lyrics that are social commentaries or outright protest-songs, often taking up the American issues of race in the Black Lives Matter tradition. The group’s de-facto leader and producer is keyboard man Kevin Ford. The CAbP on this album includes four horns, plus the guitar, keyboards, bass, Tony Allen’s drums and extra percussion. The different vocalists, male and female, and their different styles, give the material on the album different textures. 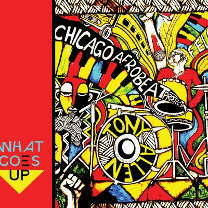 What Goes Up, the new fourth album by the Chicago Afrobeat Project is another strong recording from this long-running band who draw on the influence of Fela Kuti and the Afrobeat scene, this time with numerous guests including original Fela Kuti drummer Tony Allen, and various vocalists from the Afrobeat, soul and hip-hop scenes around Chicago. The result is a danceable but eclectic recording that draws on the great Afrobeat rhythmic grooves with vocals that might open the band up to new audiences. The playing is great, as usual, from this band with the touch of the authenticity and grit that marked Fela Kuti’s group. Tony Allen certainly brings a lot of credibility to the sound. And the lyrical material echoes the protest songs that Kuti was well-known for. Our grade for sound quality is an A-minus. The there is decent clarity and no stupid studio effects. But the recording was compressed too much, as is often the case, making it all the same volume and thus flat sounding when the impact of the percussion and horns could have had much better reproduced. World Beat music provides an excellent antidote to the insipidness of the commercial pop scene. The Chicago Afrobeat Project provides some first-rate world beat made in the USA that is danceable, musically eclectic and has something to say lyrically.